God Centered Perspective: Position. One of the best places to start our discussion of position is in the book of Job; Job is a difficult, yet encouraging book that is theologically rich. We see the opening portion of the book describing Job as “blameless and upright, one who feared God and turned away from evil,”1 who even offered sacrifices on behalf of his children, just in case his “children [had] sinned, and cursed God in their hearts.”2 Surely, if there was a man that deserved God’s favor and protection, then it was Job! The story, however, takes a jarring turn when God recommends Job (two times) for the job of suffering.3 Catastrophe strikes! Job’s wealth is taken, his children are killed, he is robbed of his health4 and yet the bible tells us that “in all this Job did not sin or charge God with wrong.”5 He even attributes his situation to God by saying “naked I came from my mother’s womb, and naked shall I return. The LORD gave, and the LORD has taken away; blessed be the name of the LORD.”6 The only thing that Job had left was a nagging wife that encouraged him to curse God.7 The bulk of the chapters that follow are comprised of Job wrestling through his feelings and emotions regarding God and his current situation, and this is accentuated by some of the worst friends in history who are “counseling” Job! As the book progresses, Job is pressing for an audience with God because he is convinced that he could argue his case that his treatment was unjust at the hands of the Almighty. This opportunity is finally afforded to Job in chapter 38 and God begins what ends up being a monologue on his eternal power, perspective and Job’s woefully limited understanding of things. Job begins to understand that he is limited in his understanding and tries to stop the conversation8, but God is not done “talking” with Job. God spends four chapters asking Job questions like, “where were you when I laid the foundation of the earth,“ “have you commanded the morning since your days began, and caused the dawn to know its place,” “can you send forth lightnings,” “do you give the horse his might,” and “is it by your understanding that the hawk soars.”9 God informs Job that “whatever is under the whole heaven is mine.”10 Job understands that he was presumptuous in thinking that he could bring his case before God. Job’s response is a good pattern for us: “I know that you can do all things, and that no purpose of yours can be thwarted. Therefore I have uttered what I did not understand, things too wonderful for me, which I did not know. I had heard of you by the hearing of the ear, but now my eye sees you; therefore I despise myself, and repent in dust and ashes.”11 There is no indication that Job ever knew the entire drama that was played out in chapters 1 & 2. Job realized that he was limited in his understanding and that God was infinite and eternal; that their perspectives were worlds apart. Prayer: Lord, please help us to remember our place in the universe – that you are Creator and that we are created; that you are sovereign and that we are not; that your perspective and understanding is eternal, infinite, and unlimited and ours is limited, finite and tiny. Purpose. To build a culture that is God glorifying, Christ centered, gospel (grace) saturated and redeeming to those that are a part of it; a culture that is marked by people in authentic pursuit of Jesus to know Him more deeply and serve Him more fully; people that are intentional about having their heart’s affections stirred up for the Lord. The fabric of this culture has some common threads that are woven in to it and help to create a worldview through which we see life and engage others as we chase after Christ. Background Assumptions. God created all things for His glory. Man was the pinnacle of God’s creation and are his image bearers. As image bearers, man is to glorify God by reflecting his attributes to all of creation, relating with God & each other, and reigning over the created order. Man’s chief end is to glorify God and enjoy Him forever. God is sovereign over all things and nothing happens that is outside of the sovereign will of the Creator. Even the fall of man did not surprise God; God is infinitely more glorified in the redemption of a rebellious and spiritually dead creation than if man would not have rebelled. The cross was not “Plan B” because “Plan A” had failed. I. God Centered Perspective. Intentionally placing God as the central figure in our faith by removing us from center stage. This means that we dwell more on who God is and what He has done than on who we are and what we need to do. A. Position. God is Creator and we are created; He is sovereign, we are not; His perspective and understanding is eternal, infinite, and unlimited and ours is limited, finite and tiny. B. Broken. As a result of the fall, ALL things are broken – man & creation – and will never be completely restored until Jesus returns. We don’t posses the power to fix things within ourselves and are powerless to effect true ongoing change apart from God’s intervention; we are spiritually dead and totally depraved. We must fix our hope on God and eternal things – this gives us the ability to face affliction, depravity, disappointment and difficulty with hope. Instead of running and hiding from difficulty or insulating ourselves, as if hardships do not exist, we can weep with those who weep and enter in to their pain and offer Hope. Only hope in God will satisfy. C. Dependent. Our initial and ongoing response to God is one of absolute surrender; we recognize that we have nothing to offer God to win His favor; all of our righteous works are like filthy rags before God. We are spiritually bankrupt and have nothing with which we can barter; we recognize our total inability before God. We rest in the finished work of Jesus. Acknowledging this moves us from behavioral modification to heart level transformation. II. Heart Motivations. When the bible refers to the heart, it is saying that it is the center of our feeling and thinking. It is what drives us and sets the direction for our life. It is where our motives and convictions lie. Whatever captivates the heart sets the trajectory for life by determining what it will pursue to gain its identity. Whatever the heart looks to establish its identity will drive the actions and behaviors to build that identity and purpose. Our hearts always move slower than our minds, just because we know it with our heads does not mean that it has transformed our hearts. God is after our hearts. A. Worship. We all worship something, we are worshipers. The problem is that we prefer to worship created things rather than the Creator of all things (Romans 1:21-25). We prefer the gifts rather than the Giver. The greatest problem in the world is not a moral, economical, or social problem; the greatest problem in the world is a failure to acknowledge and worship God. The heart must have something to worship, something to fix its gaze upon, something to pursue. It will be an idol or the true God. B. Grace. Grace is God pursued and regenerated us as we ran from and rebelled against Him; grace is God’s work in which we had no part. Law reveals sin (Romans 3:20-26) and functions to restrain its effects, but is powerless to redeem and restore the soul – only grace redeems and restores. Grace is what produces heart level transformation that empowers real and lasting change in our behaviors. Grace causes us to fix our eyes upon Another, for nowhere in scripture are we called to fix our eyes upon ourselves. Instead of just addressing the emotions and surface level behaviors, the gospel of grace addresses the root; the emotions and behaviors are symptoms of a much deeper sickness, a sickness that is terminal and can only be treated by the application of the gospel in one’s life. The gospel kills the “functional saviors” that exist in our lives. As the gospel is pressed deeper into our souls, it reveals the things that we really trust for our identity and hope. Only the continual application of the gospel in the life of a follower of Christ can transform the life and the behaviors of the Christian. III. Grace Driven Effort. The pursuit of Christ likeness and holiness from grace, not for grace. There is a big difference between the two. The gospel of grace is the basis of our holiness not the goal of it.1 All of our efforts are fueled by grace, not self discipline. This is a significant shift since many Christians discipline themselves rigorously and then become self righteous or worn out as a result. Discipline and effort that is fueled by the gospel of grace is sustainable. A. Pursuing Depth. The normative state of Christians is to be in constant pursuit of Christ to know him more deeply and be made more like him. Shallowness of faith is a sign of immaturity. It is by chasing Christ that sin looses its grip, control and influence over our lives. As the unbelievably good news of the Gospel is pressed deeper into the heart of the saint, he views God with greater grandeur, awe, appreciation and worship that produces a desire to know Him and walk with Him. Mature believers feed themselves, follow good doctrine and leave milk behind; we should develop a taste for truth, even difficult ones (like Romans 9 or Leviticus 21), pressing in to them and asking the Holy Spirit to reveal Himself more deeply. As we work through hard and difficult truths we learn important things about the character and nature of God and ourselves. B. Spiritual Disciplines. The spiritual disciplines are often times called “The Means of Grace.” There is an acknowledgement that the disciplines, in and of themselves, are powerless to produce love and affection or effect any sustainable change in our lives. The disciplines, rather, put us in a position to empty ourselves of us and position ourselves under the waterfall of God’s grace so that we can be filled and transformed. The disciplines move us to dwell on ultimate realities. The disciplines exist to stir up our affections for the Lord and foster authentic pursuit of Christ. C. Missional Living. If the gospel has transformed us inwardly, it will propel us outwardly. If we are here to glorify God then living on mission, by nature, involves tangible ways in which we glorify God. Not just “religious ways,” but also in our every day lives as accountants, mom, mechanics, engineers, doctors and construction workers. If God just gave us a formula of what we should do then that would be the law and God is after the heart. We might feed the poor, build a school or care for orphans, but we will not make disciples, transform souls or glorify God. Midweek | The Doctrines of Grace | Pastor Tullian from Coral Ridge on Vimeo. Small group curriculum pervades the landscape in our world, but this study stands far above the crowd. This nine week study is easy to lead, facilitates strong biblical discussion and is dripping with the relevance of the gospel in our every day lives as we pursue growth in Christ. 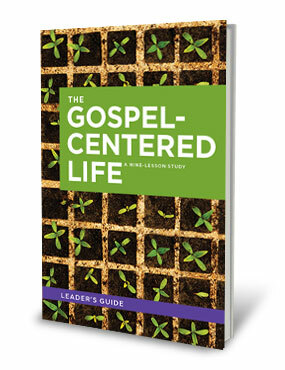 This is not just a theologically rich study, but is also very practical in its real world application of how we pursue gospel-centrality in our every day lives. • Chapter 1: The Gospel Grid. This chapter builds a framework for interacting with the gospel. It has a very helpful diagram concerning our growing awareness of God’s holiness and our sinfulness. This chapter addresses the gospel as not “just the means of our salvation, but the means of our transformation.” The chapter closes out with an exercise on what motivates us to judge others. • Chapter 2: Pretending & Performing. This chapter builds on the diagram from chapter one. It discusses specific ways in which we “shrink the cross.” As we loose sight of our sin before a holy God, we begin to pretend that we really aren’t that bad. Conversely, when we loose sight of how Holy God is and our inability to earn His favor apart from Jesus, we begin to perform in an effort to earn His favor. • Chapter 3: Believing the Gospel. This chapter expands on the previous chapter by helping the reader to understand that they do not need to pretend or perform to be right before God. It is not by our own efforts that we are made right before God – and we need to be reminded of that! “The good news of the gospel is not that God favors us because of who we are, but that he favors us in spite of who we are.” The scripture discussed in this chapter is 2 Peter 1:3-9. It closes out with a very helpful assessment to determine how we view ourselves before God, as orphans or children. • Chapter 4: Law & Gospel. This chapter explores the relationship between the law and the gospel. In this chapter two terms are introduced, legalism & license, to help illustrate the extremes that are often held by Christians. When we tend toward legalism, we believe that God’s approval is based on our obedience. When we tend toward license, we believe that God has forgiven us and that God’s commands no longer are important. The authors summarize the relationship between the two like this: “the law drives us to the gospel and the gospel frees us to obey the law. Realizing all that God expects of us should drive us in despair to Christ. And once we are united with Christ, the indwelling Holy Spirit causes us to delight in God’s law and gives us power to obey it.” This chapter ends with a helpful exercise to identify if the reader tends toward legalism, license or gospel. • Chapter 5: Repentance. This chapter develops the concept that “biblical repentance is the norm for gospel-centered living.” This devlopes the idea that we need to be living a lifestyle of repentance because of our proclivity to shrink the cross by our performance and pretending. This chapter is VERY HELPFUL in identifying our motives for repentance. This chapter unpacks what biblical repentance looks like and has a helpful exercise at the end of the chapter to help develop biblical repentance. • Chapter 6: Heart Idolatry. This chapter is possibly the most impactful in the entire study. It begins to provide concrete ways to apply the material in the study. The driving thrust of this chapter is where is our faith (trust) placed? It pushes the reader to go deeper than just “surface sins,” and mine out the heart level idols that lurk deep within. This chapter is a must read for all Christians – especially those who have been in the faith for many years. It unpacks common heart idols and presses the reader to evaluate his own life carefully. • Chapter 7: Mission. This chapter discusses how the gospel’s relevance is not just inward and personal, but also is expressed outwardly by people living differently. “If the gospel is renewing you internally, it will be propelling you externally.” This chapter does an excellent job of moving Christians to love, serve, engage and live missional lives without doing it out of duty and drudgery. Missional lives are a “natural overflow of the gospel’s work inside of us.” This chapter ends with a great exercise on examining our hearts when it comes to living on mission. It does not tell you to go and do, but rather helps the reader to identify the heart issues that are preventing them from living on mission with joy. • Chapter 8: Forgiveness. This chapter expands on how the gospel’s work internally drives us to forgive others biblically. Forgiveness is a problem for many people – even Christians! The remedy for this is the gospel! The more that we understand how costly our own sin is and the lengths to which God went to redeem us, the more we will be moved to forgive others. This chapter presents a balanced view of forgiveness, offering the readers an understanding of the difference between forgiveness and repentance. “Forgiveness involves a heart that cancels the debt but does not lend new money until repentance occurs. Like God, we take the initiative to move toward those who have offended us and we invite them to move toward us in repentance.” This chapter also offers a very helpful homework assignment to help the reader identify where unforgiveness may have crept into their heart. • Chapter 9: Conflict. The last chapter shows the reader how we engage others in conflict in a healthy way. The study identifies two general types of people: attackers and withdrawers when it comes to conflict and shows how “God did not pour out his wrath on us (attack) or remove his presence from us (withdraw). Instead, he sacrificially moved toward us in the person of Jesus, full of grace and truth.” There is a great matrix that helps the reader determine how he responds and how the gospel responds. Additionally, the end of the chapter offers practical steps for implementing gospel-centered conflict resolution in the real world. I cannot reiterate enough the culture shift that the authors present in this study. There is no hint moralism or man-centeredness. They masterfully present a theologically rich, God saturated study that is not “heady” or overly “theoretical.” This study provides a great framework for helping believers work out their salvation with fear and trembling by using the gospel as the means for growing in sanctification. There is a Leader’s Supplement Guide available here. This is the third post in this series. The last post is here. We must intentionally focus more on God and far less on us and what we must do for God (as if He needs anything from us4). We need to be persistently reminded of the sovereign majesty of our Creator because we easily forget; this seems to be the pattern of humanity’s response to God in the scriptures.5 When this happens, we make moralism and the practical application of scripture our primary pursuits, brushing over the deep truths of scripture that provide the fuel for applying them to our lives. Practical application is good and necessary, but when we spend the majority of our time on how to apply the scriptures and very little time on the God of the scriptures, we rob our people of the very Fuel that it takes to apply the scriptures to their lives! The irony in this is that the more emphasis that we place on what people should be doing, the less people actually do the very things that they are being told to do! Their lives aren’t truly transformed by the gospel of grace, they don’t live missionally, their souls are dry with no affection for God nor do they have any significant influence on the world around them. This is because they are depending upon themselves to see their lives changed and obey God. Instead, we need to be captivated with God’s goodness, love, grace, mercy and the wrath that He has rescued us from – these are the things that produce true spiritual transformation. In a God centered culture, it is understood that proximity to Christ6 is what changes us, not our own efforts. As we focus more on God’s character and nature we move from external behavior modification to heart level transformation and see spiritual sustainability established in the lives of Christians. Everyone has a theology – a believe about God – it is just that the theology held by many Christians is not biblical, historically accurate nor orthodox. For many, they are far more influenced by pop culture than by orthodox doctrine or theology. We must have a steady diet of Christ centered, God exalting, biblical, orthodox teaching that forms an accurate worldview through which we view God, others, the world, pain & suffering and our place in this world. Most Christians know what they should do – how they should act & feel – but fail to consistently pursue these things because their theology is man centered. Our theological framework provides the foundation for everything that we believe, think, feel and ultimately do in life. A strong God saturated theological framework answers the question of “why we live our lives the way the bible tells us to,” and provides us with the fuel to live our lives that way. We need to develop a taste for doctrine, theology and biblical Christianity so that we are able to face many of life’s greatest challenges. Theology and doctrine are not primarily academic or intellectual pursuits, but are the vehicle for us to know God more deeply and passionately pursue Him more fully. We need good, solid God honoring doctrine woven in to the fabric of the culture of our churches in order to foster authentic pursuit of Christ. This must be intentional or it will naturally devolve into man centeredness. There are many ways to accomplish this, but whatever the method, it must be infused in the culture of the church by being intentional about what is taught and how it is taught. 2When we say God centered versus man centered, what is meant is who do we focus on primarily in our study, teaching and practice. In a God centered culture, the bulk of time and teaching is spent expounding on who God is and what He has done for His people. In a man centered culture, the bulk of time and teaching is spent on who we are and what we should be doing for God. This may sound subtle, but its implications are profound; one places God as the central cause of transformation and the other places transformation on our shoulders to pull off on our self disciplined efforts. 5The Old Testament is filled with narratives of God’s people regularly forgetting God and pursuing their own way, they are shifting from God centered to man centered and the consequences are always catastrophic. The pattern we see repeated in the New Testament, especially by Paul in the epistles, is a systematic approach to reminding the churches that are being addressed of their inability, depravity, and place in the universe and God’s greatness. There is a constant rebuilding of who God is and who they are before any application is mentioned. We see this especially in Romans when Paul spends the first eleven chapters discussing the richest and deepest truths of our faith before he ever begins to address what our response is in chapter twelve. The first three chapters of Ephesians is a systematic unpacking of the gospel and God’s grace towards those who believe before any application is mentioned in chapter four. Philippians and Colossians both intertwine the gospel and the grace of God with how to live out the gospel in practical ways. The entire letter of Galatians is about shifting from man centered faith (law) to God centered faith (grace). Apparently, we need to be reminded on where our strength and affections lie.